The following series of posts will consist of the biography I wrote back in 2003-4 of Ñanavira Thera, an English monk who lived the last decade of his life in Sri Lanka. While long an obscure figure in Buddhist circles–one might almost call him a minor “cult figure”–Ñanavira has been steadily gaining wider recognition, especially through the writings of Stephen Batchelor, who discussed him in Buddhism Without Beliefs. To the best of my knowledge, my biography is the most complete of him available, or at least the best I’ve seen. (By all means, if something better comes along, and you hear about it, let me know!) The volume of Ñanavira’s collected writings, Clearing the Path, published by Path Press, has affected my life and thinking more than any other book, Buddhist or otherwise, and is one of the few Dharma books I can recommend without reservation, though it is admittedly demanding. People wanting to know more about this brilliant and iconoclastic man can go to the links on my homepage for the Ñanavira Thera Dhamma Page and the Path Press website. Who Was the Venerable Ñanavira Thera? He was born Harold Edward Musson on January 5, 1920 in the Aldershot military barracks near Alton, a small, sleepy English town in the Hampshire downs an hour from London. His father, Edward Lionel Musson, held the rank of Captain of the First Manchester Regiment stationed at Aldershot’s Salamanca Barracks. A career officer, Edward Musson later attained the rank of Lieutenant Colonel and probably expected his son and only child to follow in his footsteps. His wife, nee Laura Emily Mateer, was Harold’s devoted mother. The family was quite wealthy, with extensive coalmine holdings in Wales. Much of Harold’s youth was spent at a mansion on the outskirt of Alton, within sight of a Benedictine abbey. Townspeople describe the boy as solitary and reflective; one remembered Harold saying that he enjoyed walking alone in the London fogs. The same neighbor recalled Harold’s distaste for a tiger skin displayed in the foyer of the family’s residence, a trophy from one of his father’s hunts in India or Burma. By this time the introspective boy had become a young man with a taste for music—he enjoyed Mozart, the late Beethoven, Bartok, and Stravinsky—and a love of literature. He confessed, however, that he was “not a great reader of poetry,” preferring ideas to images, a fact reflected in his natural philosophical bent. A man of his time, he was most drawn both then and later to those writers and thinkers who best characterized the interwar period, the era that became known as Europe’s “Age of Anxiety,” during which the whole of the Western intellectual tradition was questioned and challenged. He read, among others, Kafka, Sartre, and Huxley, from whom he learned that, as he later wrote, “there is no point in life”—a common European sentiment of the day. But the writer who most drove this lesson home for him was Joyce who, he said, “had a great influence on me.” He later described Joyce’s landmark novel Ulysses as “grossly obscene” yet “profoundly moral,” the purpose of which was to “hold a mirror up to the average sensual Western man, in which he can recognize his image.” Speaking of the characters in the book, he said what most affected him was “the ultimate meaninglessness and futility of all their actions and aspirations”—and his recognition of himself in them. Whether or not this was Ñanavira’s ipsissima verba can’t be known, but it seemed an unlikely outcome in 1940, for with war raging on the continent Harold enlisted in the Territorial Royal Artillery. It was probably not entirely by choice—a family acquaintance spoke of him as having “completely resented warfare,” and in a later letter as Ñanavira he said he agreed with Huxley that “there were three kinds [of intelligence]: human, animal, and military.” Given his family background and the acute need of the times, though, there was probably little else he could have done. In July 1941 he was commissioned Second Lieutenant in the Intelligence Corps, where he became an interrogator of prisoners. In 1942 he was promoted to Lieutenant and in 1944 to Temporary Captain. Between 1943 and 1946 he served overseas with the British Eighth army, primarily in North Africa (in Algiers) and Italy. He spent most of 1946 in a hospital in Sorrento, Italy for reasons unknown. During his time there he encountered a book that was to have a decisive influence on him, and which marked his first definite involvement with Buddhism. The book was La Dottrina del Risveglio [The Doctrine of Awakening] by Julius Evola. Evola’s case mirrored Harold’s in many ways. Born into a devout Catholic family in 1898, Evola served in an artillery regiment in the First World War, but after the war found it impossible to resume a normal life, being filled with “feelings of the inconsistency and vanity of the aims that usually engage human activities.” As a result, he sought solace in art, drugs, and, finally, suicide—from which act he was saved by a passage he encountered in the Pali Suttas, the oldest Buddhist scriptures. Perhaps his labor over Evola’s ideas of Buddhist discipline finally drove home for Harold the contradictions and unsatisfactoriness of the life he was leading. As he later related to Maugham: “I had plenty of time and plenty of money. And I painted the town red. I tried to enjoy myself. I tried to get as much pleasure out of life as I could… But somehow I found that I wasn’t happy… I wasn’t really enjoying myself. I felt that it was all pretty futile…” And so it was that one evening in 1948 he found himself in a bar, where he met a fellow officer whom he’d known from the war, Osbert Moore. 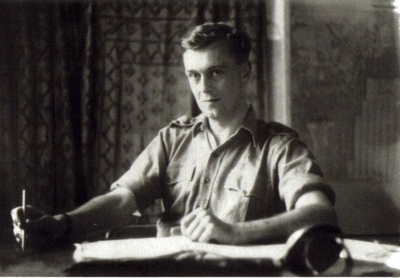 Moore was fifteen years Harold’s senior, had graduated from Exeter College at Oxford, and served during the war as a staff officer in Italy where the two men had met. Presently he was working at Bush House as Assistant Head of the BBC Italian section. Moore too had read some books on Buddhism, including Evola’s, and been affected by them. Their conversation turned to Buddhism, and, as Harold later recounted, he and Moore gradually “came to the conclusion that the lives we were leading… were utterly pointless.” By the time the pub closed, the two had decided that together they would abandon the world and go to Ceylon to ordain as Buddhist monks. 1. Robin Maugham, Search for Nirvana (London: W.H. Allen, 1975), p. 189. 2. Clearing the Path, p. 378. 6. Ibid, p. 304 and ibid, p. 292 fn. (d) respectively. 9. Robin Maugham, op. cit. 11. Julius Evola, Le Chemin du Cinabre (trans.) (Milan: Arché-Arktos, 1982), p. 12. Quoted in Stephen Batchelor, “Existence, Enlightenment and Suicide: The Dilemma of Nanavira Thera,” from Tadeusz Skorupski (ed. ), The Buddhist Forum, Vol. IV (London: School of Oriental and African Studies, 1996). 12. Julius Evola (trans. by Harold Musson), The Doctrine of Awakening: A Study on the Buddhist Ascesis (London: Luzac, 1951), p. ix. 13. Robin Maugham, op. cit., p. 189.